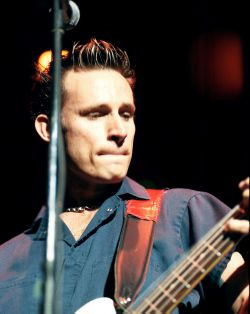 Mike Dirnt, born Michael Pritchard, was born on May 4th, 1972. His mother was a heroin addict who put him up for adoption. When he was just 7 years old, his adoptive parents got divorced and moved him a lot between homes. As a teenager, he decided to make it on his own and eventually ended up working at Rod's Hickory Pit with Billie Joe's Mother. Mike rented a room on the side of Billie's house and stayed there while they were in high school. In August of 1996, Mike married his girlfriend, Anastasia. In April of 1997, their daughter, Estelle-Desiree was born. Their marriage started to fail and they were later divorced, but still keep in touch. Mike loves his daughter very much and spends as much time with her as possible when he's not on the road.